Amarjit Singh, Kurukshetra University, India received the Best Academic Administrator of the year 2018 award from the dignitaries of the 8th ASDF Global Awards 2018. 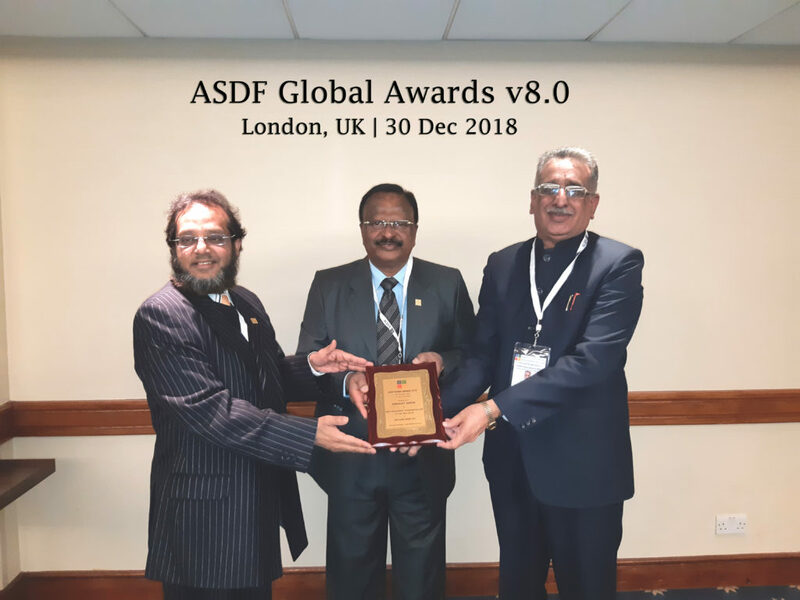 The 8th ASDF Global Awards 2018 V8.0 happened at Holiday Inn London – Wembley, London, United Kingdom on 30th December, 2018. This 8th Edition has 17558 nominations which was condensed to the count of 14. ASDF Global Awards has become one of the premier awards since the inception of the award because of the validation process of the nominees and neutral review. After years together, ASDF has gained this fame which is constantly maintained by the council members. The committee changes once in every 4 years or when one of the member is deceased. The First ASDF Global Awards happened at Hotel Sunway GRT, Pondicherry. The Second ASDF Global Awards happened at Hotel Accord, Pondicherry. The Third ASDF Global Awards happened at Anandha Inn Convention Center, Pondicherry. The Fourth ASDF Global Awards happened at Holiday Inn Silom, Bangkok, Kingdom of Thailand. The Fifth ASDF Global Awards happened at Shenbaga Convention Center, Puducherry, Republic of India. The Sixth ASDF Global Awards happened at Oakland University, University in Rochester, Michigan, United States of America. The Seventh ASDF Global Awards happened at Holiday Inn Resort, Goa, Republic of India. Numerous Professors and Researchers across the world have been awarded. The process goes by self-nomination and continues in various levels and phases. Remarkable Guests are Gunasegaran Sengodan, Maaruf Ali, Kokula Krishna Hari Kunasekaran!